No missing the pet-friendly greeting, the the Entry Sign Literature Holder Rides Sidesaddle is a bit recessive of secondary focus. Of course if you see the signs, you see the side-saddle Literatue Holder and store flyers, so mission accomplished. Would the Brochure Holder be better on the near rather than far side? Or better yet, both sides? 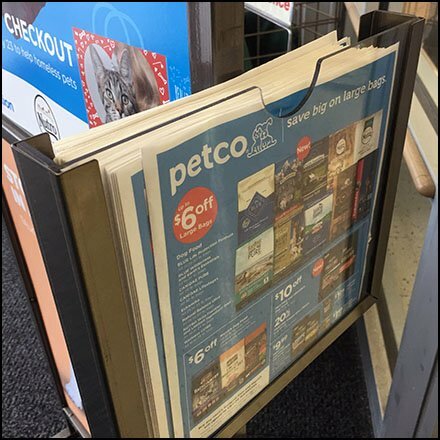 Consider as you browse the Petco Entry Sign Brochure Holder gallery of images.